You don't need to keep showering under an outdated, cruddy shower head. Replacing it is easy—just follow this guide and go with the flow. An old and corroded shower head not only looks unattractive to shower underneath, but the outdated model can be costing you more on your monthly water bill. 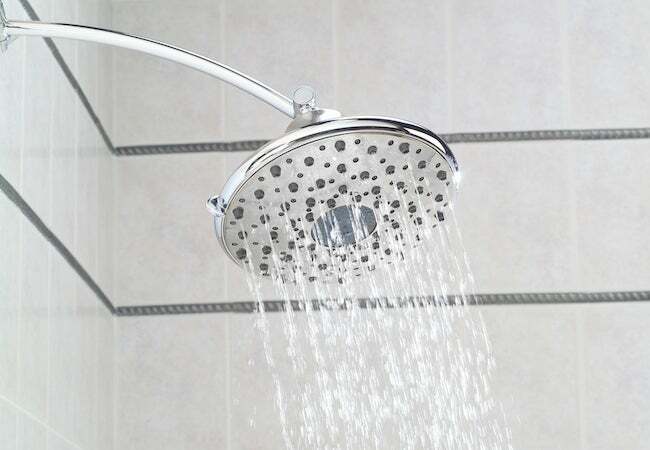 For a quick fix, replace the shower head with an energy-efficient low-flow model. This newer option doesn’t mean low pressure either, it just uses less water per minute, which saves resources in the long run. Follow these steps to learn how to change a shower head and install a new fixed-mount or handheld shower head with ease. Remove the old shower head. First, try turning it counterclockwise a few times to see if you can remove it by hand; if it won’t budge, grab the towel and tools for assistance. Wrap a cloth around the shower arm—the pipe that connects the shower head to the wall—to protect it from damage as you grip onto it with slip-joint pliers. Then, clamp the adjustable wrench around the head’s base and twist it off counterclockwise until it’s removed from the arm. As there’s likely some rust, scale, and other debris left behind from your old shower head, use the rag to clean inside and outside the arm. Not only will that clear a path for better pressure and cleaner shower water, but it will also make the installation process of your new shower head much easier. Find the series of linear grooves, also called threads, at the end of the shower arm, and apply two or three passes of Teflon tape over them in a clockwise direction. Press the tape firmly into the threads with your fingers with each wrap-around so that you can start to see them through the tape. This specialty plumbing tape acts as a seal: When you twist on a new shower head, it ensures a snug fit and prevents water flow from leaking where the hardware screws together. Keep the tape handy, since you might need it again when you check for leaks at the end of the installation. Now, it’s time to install your replacement head. • If you’re installing a fixed-mount model, you should be able to screw it on by hand. Just place the new head on the shower arm and twist it clockwise until it’s securely in place. Be sure to follow any special instructions from the manufacturer. • If you’re installing a simple hand-held model, screw the mount from the new shower head kit to the end of the arm clockwise, then connect the end of the shower hose to the mount. As always, check to see if the manufacturer has additional instructions. Before you wash your hands of this job, check for any leaks that could lead to wasted spray and high water bills. After installing the new shower head, take a step back and turn the water on for a few moments. If you see any streams of water coming from the wrong parts of the hardware, turn off the water once more so that you can disassemble the head and secure it with more Teflon tape. Then, tightly re-secure it to the arm. Repeat steps 3 through 5 until your shower head is leak-free. Keep It Moving. To ensure that your new hardware works properly and water flows freely in the long run, clean your shower head at first signs of clogs or lower water pressure in order to keep scaly buildup at bay. You can either use a cleaner or unscrew the head and put it in the dishwasher. Whatever maintenance approach you choose, just make sure to regularly clean it so you have a refreshing shower for years to come.